Every superyacht owner is the king of his own domain while out on the waves but what about when you’re back on land? If you’ve ever dreamed of joining the landed gentry or simply fancy a grand home with which to impress guests, then few property options are more appealing than an historic castle. Better yet, with chateaus and palaces available across the Mediterranean, you needn’t even be very far from your yacht. Chateau de la Barben, Provence If it’s a slice of history you’re after then few can boast more than this centuries-old chateau handily located just 20 minutes from Aix en Provence and in close proximity to the Cote d’Azur’s abundance of superyacht facilities. Believed to be over 1,000 years old, the castle is first mentioned in documents from 1064 and was owned by King René until 1474 when it was sold to the illustrious De Forbin family within which it stayed for the next 500 years. Set on 307 hectares of grounds primed for fishing from two natural rivers and hunting deer and game, the castle and outbuildings – which include a guardian’s apartment, watchtower and gatehouse - span 5,185 square metres. Extensive redevelopment by the current owner has seen the 13 bedrooms, grand dining room, hand-painted sitting room, drawing room, rustic kitchen and other impressive entertaining spaces sensitively modernised in-keeping with the building’s character. Outside, 10,000 square metres of landscaped gardens by André Le Nôtre are complemented by wilder areas with plenty of potential for extensive vineyard development. 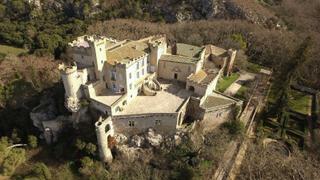 Chateau de la Barben is available with price on application with Propriétés de Provence Sotheby's International Realty. Every superyacht owner is the king of his own domain while out on the waves but what about when you’re back on land? If you’ve ever dreamed of joining the landed gentry or simply fancy a grand home with which to impress guests, then few property options are more appealing than an historic castle. Better yet, with chateaus and palaces available across the Mediterranean, you needn’t even be very far from your yacht. If it’s a slice of history you’re after then few can boast more than this centuries-old chateau handily located just 20 minutes from Aix en Provence and in close proximity to the Cote d’Azur’s abundance of superyacht facilities. Believed to be over 1,000 years old, the castle is first mentioned in documents from 1064 and was owned by King René until 1474 when it was sold to the illustrious De Forbin family within which it stayed for the next 500 years. Set on 307 hectares of grounds primed for fishing from two natural rivers and hunting deer and game, the castle and outbuildings – which include a guardian’s apartment, watchtower and gatehouse - span 5,185 square metres. Extensive redevelopment by the current owner has seen the 13 bedrooms, grand dining room, hand-painted sitting room, drawing room, rustic kitchen and other impressive entertaining spaces sensitively modernised in-keeping with the building’s character. Outside, 10,000 square metres of landscaped gardens by André Le Nôtre are complemented by wilder areas with plenty of potential for extensive vineyard development. Chateau de la Barben is available with price on application with Propriétés de Provence Sotheby's International Realty. Built in the 14th Century, this spectacular chateau in the heart of the Madiran winelands is offered in turnkey condition and boasts an elegant blend of modern convenience and historical character. Originally built as a Catholic monastery, the chateau was converted into an impressive home by Jean d’Arricou, the Abbot of Montpezat, during the Protestant reformation of the 16th Century. The castle was extended in the 18th Century but fell into disrepair before being saved from ruin in the 1970s. While much of the original architecture remains, the chateau’s interiors have been extensively refurbished in recent years making it an ideal investment as a unique family home. The main building, known as Saint-Jacques, contains five spacious bedrooms and four bathrooms along with a large living room, kitchen and dining room complete with fireplace and exposed beams. A show-stopping 250 square metre terrace built on the castle’s former buttresses can also be accessed from the main building for incredible views over the Pyrenees. Alongside the main building, a recreational area known as the Tower of Saint-Michel offers a bar, wine cellar, snooker room and private guest suite with bathroom while a separate building called Maison d’Amis contains a further three bedrooms, bathroom and kitchen making it ideal for guests or staff. Chateau d’Arricau-Bordes is listed for sale for €2,090,000 with Knight Frank. Built in the 14th Century, this spectacular chateau in the heart of the Madiran winelands is offered in turnkey condition and boasts an elegant blend of modern convenience and historical character. Originally built as a Catholic monastery, the chateau was converted into an impressive home by Jean d’Arricou, the Abbot of Montpezat, during the Protestant reformation of the 16th Century. The castle was extended in the 18th Century but fell into disrepair before being saved from ruin in the 1970s. While much of the original architecture remains, the chateau’s interiors have been extensively refurbished in recent years making it an ideal investment as a unique family home. The main building, known as Saint-Jacques, contains five spacious bedrooms and four bathrooms along with a large living room, kitchen and dining room complete with fireplace and exposed beams. A show-stopping 250 square metre terrace built on the castle’s former buttresses can also be accessed from the main building for incredible views over the Pyrenees. Alongside the main building, a recreational area known as the Tower of Saint-Michel offers a bar, wine cellar, snooker room and private guest suite with bathroom while a separate building called Maison d’Amis contains a further three bedrooms, bathroom and kitchen making it ideal for guests or staff. Chateau d’Arricau-Bordes is listed for sale for €2,090,000 with Knight Frank. Looking for an unusual property with business potential? Via Cambiano, located a short distance from Turin in the Italian region of Piedmont, is primed for transformation into a highly unusual luxury hotel. Built for the Marquis of Saluzzo in the 14th Century, the castle is entered via a traditional drawbridge and fortified gate and retains much of its original architecture thanks to careful preservation. Offering eight opulent bedrooms, five full bathrooms, a private chapel and a host of entertaining space, the castle's most recent restoration was undertaken by Alfredo d’Andrade in the late 1800’s. Despite its age, the eye-catching décor has been meticulously maintained with a number of murals and frescoes in immaculate condition adding to the property’s period charm. There is also a sweeping garden offering gorgeous views and an usual swimming pool fed by a fountain. Via Cambiano is listed for sale for €2.5 million with Italy Sotheby’s International Realty. Looking for an unusual property with business potential? Via Cambiano, located a short distance from Turin in the Italian region of Piedmont, is primed for transformation into a highly unusual luxury hotel. Built for the Marquis of Saluzzo in the 14th Century, the castle is entered via a traditional drawbridge and fortified gate and retains much of its original architecture thanks to careful preservation. Offering eight opulent bedrooms, five full bathrooms, a private chapel and a host of entertaining space, the castle's most recent restoration was undertaken by Alfredo d’Andrade in the late 1800’s. Despite its age, the eye-catching décor has been meticulously maintained with a number of murals and frescoes in immaculate condition adding to the property’s period charm. There is also a sweeping garden offering gorgeous views and an usual swimming pool fed by a fountain. Via Cambiano is listed for sale for €2.5 million with Italy Sotheby’s International Realty. Constructed in 1792, this comparatively modern manor house estate is the perfect purchase for those keeping their yachts in France’s most popular coastal destination. Located just 35km from Nice, the property is perched on the coastline at St Jean de Grasse and boasts panoramic views over the Mediterranean which can be enjoyed from its beautiful landscaped gardens and vast terraced areas. Inside, the main house offers seven bedrooms, including a large master suite with dressing room and sitting room, five bathrooms, an impressive entrance hall, living room with dining area, formal dining room, kitchen, TV room, games room, cinema and utility room. A caretaker’s house offers a further four bedrooms along with two bathrooms, a kitchen, living room and private terrace while the 1.8 hectares of private grounds boast a heated salt water swimming pool with pool house and summer kitchen, tennis courts and expansive parklands. 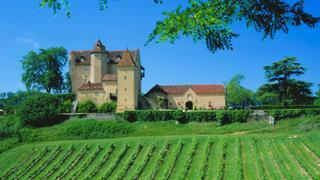 The St Jean de Grasse estate is listed for sale for €9,500,000 with Knight Frank. Constructed in 1792, this comparatively modern manor house estate is the perfect purchase for those keeping their yachts in France’s most popular coastal destination. Located just 35km from Nice, the property is perched on the coastline at St Jean de Grasse and boasts panoramic views over the Mediterranean which can be enjoyed from its beautiful landscaped gardens and vast terraced areas. Inside, the main house offers seven bedrooms, including a large master suite with dressing room and sitting room, five bathrooms, an impressive entrance hall, living room with dining area, formal dining room, kitchen, TV room, games room, cinema and utility room. A caretaker’s house offers a further four bedrooms along with two bathrooms, a kitchen, living room and private terrace while the 1.8 hectares of private grounds boast a heated salt water swimming pool with pool house and summer kitchen, tennis courts and expansive parklands. The St Jean de Grasse estate is listed for sale for €9,500,000 with Knight Frank. The traditional horseshoe-shape of this elegant 16th Century castle in Turin, while unusual to modern eyes, is ideal for making the most of the lush parkland from which it rises. Split into three wings, two of which offer direct access to a charming internal courtyard with cloister and well, the ‘Oriental wing’ boasts a square tower and terrace with views over the Alps. Elsewhere, 12 sumptuously decorated bedrooms, nine bathrooms, a sitting room, rustic kitchen, dining room and games room are spread among the property’s two storeys. The estate also features a guard house, maid’s house, farm building, barns, fruit garden and private lake. 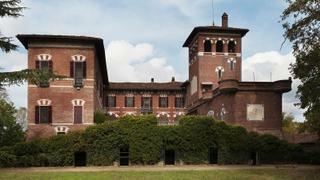 San Michele castle is listed for sale for €4,800,000 with Italy Sotheby’s International Realty. The traditional horseshoe-shape of this elegant 16th Century castle in Turin, while unusual to modern eyes, is ideal for making the most of the lush parkland from which it rises. Split into three wings, two of which offer direct access to a charming internal courtyard with cloister and well, the ‘Oriental wing’ boasts a square tower and terrace with views over the Alps. Elsewhere, 12 sumptuously decorated bedrooms, nine bathrooms, a sitting room, rustic kitchen, dining room and games room are spread among the property’s two storeys. The estate also features a guard house, maid’s house, farm building, barns, fruit garden and private lake. 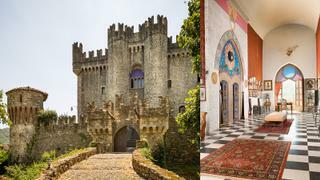 San Michele castle is listed for sale for €4,800,000 with Italy Sotheby’s International Realty.